Whether it is companies that have experienced share price declines due to regulatory uncertainty, or industries that are generally out of favour, our best returns have historically come from recognising opportunities where others have decided that the issues are simply “too hard”. One sector that currently ticks all the (wrong) boxes, and has grabbed our interest is retail. The retail industry is renowned for being a graveyard, and with rapid change occurring in the industry, profiting in the space has become increasingly difficult. 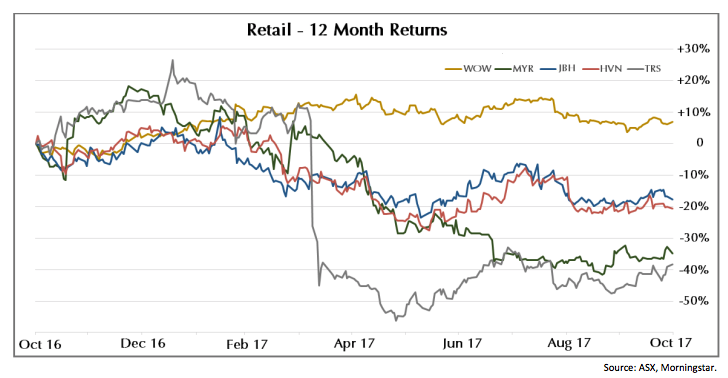 As illustrated by the following graph, even blue chip retail brands have had a difficult time of late. The challenges faced by the retail industry are vast and complicated, from changing consumer expectations and changing consumer preferences to increased global competition. In days gone by, any one of these factors would be enough to trouble even the best of retail operators. in a generational shift, fashion changes far faster than it used to. While shoppers in the past would be prepared to ‘invest’ in an outfit, todays Gen Y shopper prefers to shop for the latest fashion, more often. As such, shoppers now look for fashion at lower prices (lower prices at the expense of quality). Stores like H&M have recognised this shift in consumer expectations and have catered their offering accordingly. In contrast, some of Australia's more entrenched brands appear to be struggling with the new shopping trends. In years gone by, retailers saw Australia as the location that last years fashion came to die. With high barriers to entry and limited competition, it was common practice to see outdated fashion in our stores. Due to improved communication (and shopping options), retailers can no longer expect local consumers to settle for out-dated styles. Those stores that have been able to import or design ‘current’ and ‘edgy’ products have a distinct advantage to those stores still treating the Australian consumer with contempt. 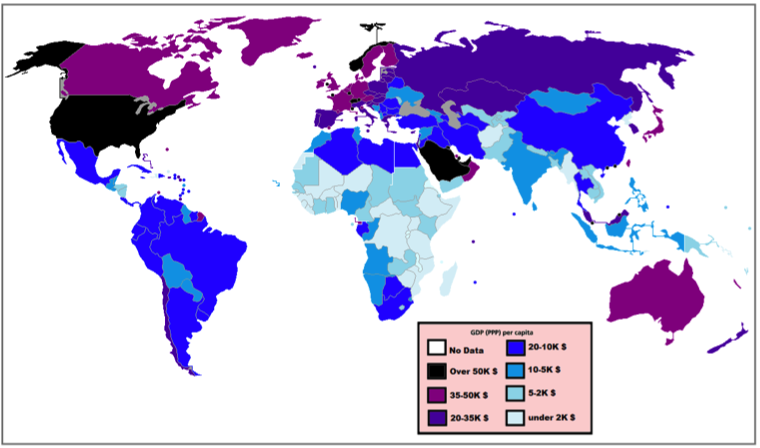 It remains a point of contention that computers and technology available in the US and greater Asia are often not available in Australia until months later and at much higher price points. Internet shopping has quickly impacted on local retailers and their ability to achieve margins higher than their overseas competitors. Though pricing disparity still exists in Australia, the ease and availability of products to consumers with even the slightest amount of technology savvy has seen a marked improvement in domestic retailers willing to invest in technology and the distribution process. Despite the view that retail is a difficult market, there appears to be a number of international players that see Australia as a growth opportunity. With higher margins available in Australia and a relatively affluent population, several international players have made it work in the Australian domestic market. That said, its not a simple proposition. As previously mentioned, the local market has increasingly high expectations, but when those expectations have been met, those companies have been rewarded. Outside of high fashion and technology, Aldi (and soon Lidl) took note of the two key players in the Australian grocery market and decided that there was room for competition. Aldi in particular has seen excellent growth since their entrance into our market in 2001 with hundreds of stores now open across Australia. Additionally, Amazon’s planned entrance into the Australian market is sure to shake up the industry. As yet, there remains uncertainty as to how Amazon will impact the local retail environment, but it seems rather certain that current players will be watching closely as Amazon slowly reveal their intentions. As investors, our view would suggest that if experts in the industry see opportunity in Australian retail, then it’s probably worth paying attention. There appears to be a distinct contradiction between how the Australian stock market views the domestic retail space and how international experts see things. Our goal, as ever, is to recognise emotional behaviour and its impact on share prices, and to take advantage of it. As noted previously, many of Australia's favourite brands have seen their share price struggle. Some of those struggles can be attributed to the structural change in the global retail environment; some it can be attributed to nervousness about Amazon’s entry into Australia. However, a significant portion of the share price declines can be attributed to an unfounded pessimism that dominates the industry at the moment.